The mid-size sedan that started a small revolution in India has just gone under the knife to receive a more premium makeover. The Honda City may have started out as a hatchback in Japan, but when it came to India in 1998 it was a mid-sized sedan that started a revolution of sorts. Admittedly, there wasn’t much to choose from back then, but it was such a ‘good’ car that it broke down barriers and practically created a cult following. Now, two decades later the Honda City is in its sixth generation, and the Japanese carmaker has given the City a much-needed makeover to adhere to the changing times – where features and safety play a big role in a buyer’s decision. Like all fresh facelifts, the Honda City gets a new design as well as some added features and safety systems. The exterior design has been given a makeover, which includes a revised front-end that gets a new bumper bearing sharper design lines. The lower section of the bumper is now finished in black plastic and the grille gets less chrome and more mesh. There are also new full LED headlamps featuring daytime running LED strips, and the Honda City is the first car in this segment to get them. Other changes include 16-inch and 15-inch diamond cut wheels, depending on the variant, and the rear gets new tail lamps with a boot lip spoiler – which also comes with an integrated brake light in the top-of-the-line ZX variant. The most noticeable changes though are in the cabin where the Honda City gets a completely new layout to make the car seem much more modern and premium. The first thing you notice when you step inside is that the dashboard is completely new. It gets a new 7-inch touchscreen infotainment system featuring satellite navigation and Mirror Link connectivity – which enables your smart phone to give it Wi-Fi connectivity for a whole range of functions, including browsing your e-mails. In terms of space and comfort, it’s exactly the same as the previous Honda City – the dimensions of the car and the seats haven’t been altered. The rear seat has always been spacious and the cabin continues to be comfortable. The new City also gets added features, including automatic headlamps and wipers, an auto dimming rear view mirror, adjustable rear headrests, a tilt & telescopically adjustable steering wheel, and more. There’s also one-touch operation for the sunroof. In terms of safety, front airbags were standard on the outgoing model. But now it gets six-airbags on the ZX variant and there’s a rear defogger as standard across variants as well. 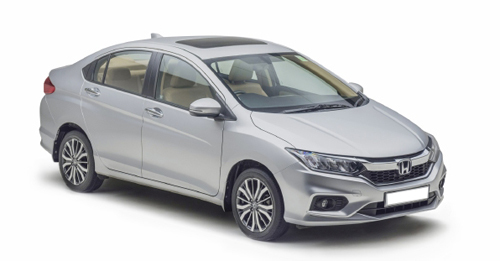 With these updates the Honda City seems to be more in tune with the times, especially since it was losing out to newer models like the Maruti Suzuki Ciaz (which will likely see a facelift soon) and the Hyundai Verna (which will see an all-new model launched later this year). There are no mechanical updates for the City though, as it retains its 1.5-litre, four-cylinder petrol and diesel engines. We drove the new City with the petrol engine, and didn’t notice any real difference on the road. The engine is smooth and the ride quality is still good for urban use. Although, I would recommend the diesel variant since the engine does deliver better performance. The diesel variant retains its 6-speed manual transmission, while the petrol variants retains the 5-speed transmission and optional CVT. 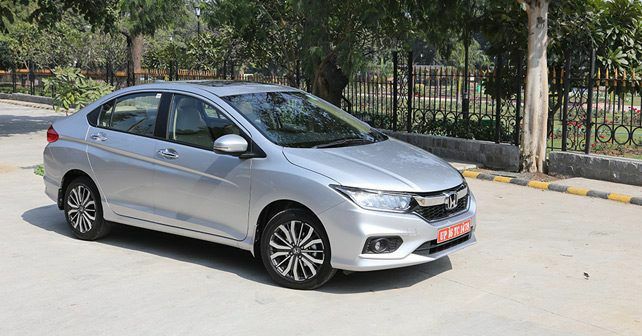 Overall, the Honda City is still a very good mid-size sedan. And while it doesn’t quite perform with the verve that it once had, it retains it dependability. And with the new design and updates, it has a slight edge over its competitors. For now!